Posted on 21, November 2018 by EuropaWire PR Editors | This entry was posted in Germany, Technology, Transportation & Logistics, Travel and tagged London Underground, mobility, Nigel Holness, Sabrina Soussan, Siemens Mobility, TfL, trains, Transport for London, urban rail system. Bookmark the permalink. MUNICH, 21-Nov-2018 — /EuropaWire/ — Siemens Mobility has been awarded a major contract in the United Kingdom. 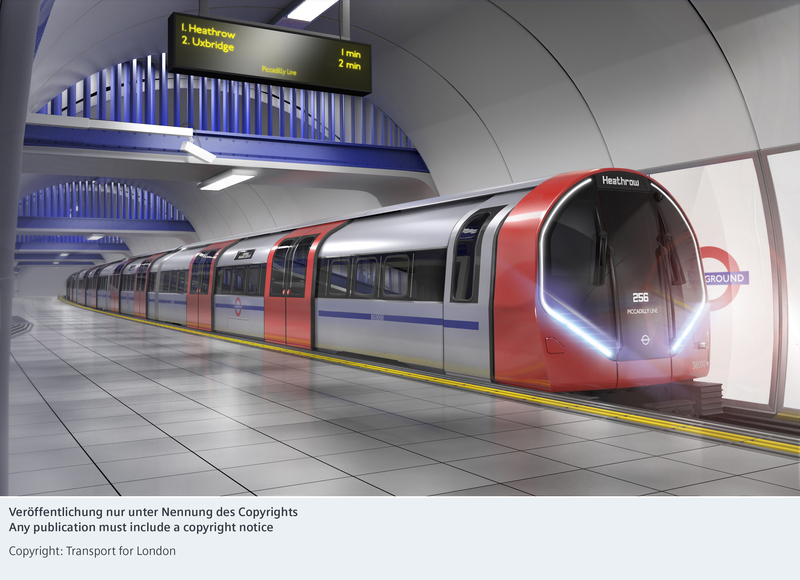 London Underground (LUL), a subsidiary of Transport for London (TfL), responsible for the urban rail system in Britain’s capital, signed a contract with Siemens Mobility to design and build 94 new generation Tube trains worth around 1.5 billion GBP (1.54 billion Euro) to replace the existing 1970s fleet. The trains will serve the Piccadilly line and delivery will begin in 2023. “Our new metro trains for London will significantly increase capacity and frequency on the Piccadilly line. At the same time, they will offer tube users substantially improved passenger experience. Our services will support London Underground over the trains’ full lifecycle to ensure that they serve the London public with the highest reliability and availability,” said Sabrina Soussan, CEO of Siemens Mobility. The new spacious Piccadilly line trains are based on Siemens Mobility’s Inspiro family of metro trains and offer passengers substantially improved comfort and convenience. The state-of-the-art Tube trains will significantly improve the experience of millions of customers, with wider doors and longer, walk-through, fully air-conditioned carriages. In addition, in-train information systems will help all customers plan their onward journey more easily. As part of a fleet services contract, Siemens Mobility will be responsible for covering the supply of spares for a period of five years beginning with the commissioning of the first trains. Siemens Mobility will also provide whole life technical support for the trains when they are out of their general warranty. Additionally, LUL has ordered digital services based on Siemens’ Railigent. TfL and Siemens Mobility will work closely together to consider options for local manufacture in the United Kingdom in partnership with Siemens Mobility’s global centre of excellence for metros in Vienna, Austria. In March 2018 Siemens Mobility announced plans for a local rail manufacturing facility in Goole, East Yorkshire, where Siemens Mobility is planning to create up to 700 jobs (and a further 250 during the construction phase), with an additional 1,700 potential UK supply chain roles. LUL has ordered the trains as part of its Deep Tube Upgrade Programme which includes the Piccadilly, Bakerloo, Central and Waterloo & City lines. By 2026, there will be increased frequencies during peak times on the Piccadilly line (up from 24 to 27 trains-per-hour), which is used by 700,000 passengers daily. This service provides a train every 135 seconds at the busiest times. The formal contract for the supply of new Piccadilly line trains is between Siemens Mobility and London Underground (a subsidiary of Transport for London). Of the 1.5bn GBP (approximate) total contract value, around 1.54bn euro is immediately bookable by Siemens Mobility, the remainder will be booked over the course of the contract (in accordance with accounting principles) as it is related to the 40 year Fleet Services Agreement. Siemens Mobility is a separately managed company of Siemens AG. As a leader in transport solutions for more than 160 years, Siemens Mobility is constantly innovating its portfolio in its core areas of rolling stock, rail automation and electrification, turnkey systems, intelligent traffic systems as well as related services. With digitalization, Siemens Mobility is enabling mobility operators worldwide to make infrastructure intelligent, increase value sustainably over the entire lifecycle, enhance passenger experience and guarantee availability. In fiscal year 2018, which ended on September 30, 2018, the former Siemens Mobility Division posted revenue of €8.8 billion and had around 28,400 employees worldwide. Further information is available at: www.siemens.com/mobility.